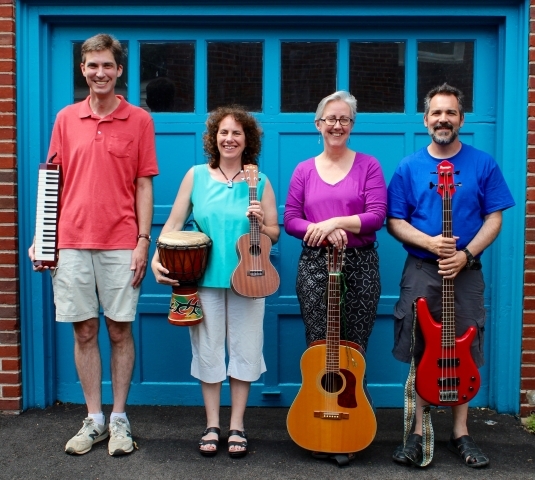 Acoustic Blender is an alternative folk group with Hope Wesley Harrison, Justin Solonynka, and David & Jenny Heitler-Klevans (otherwise known as Two of a Kind). All the members of Acoustic Blender sing, and their intricate vocal harmonies and arrangements are the centerpiece of the group. Instrumentation is varied, including guitars, piano, cajon, djembe, melodica, trombone, whistles, ukulele, and various hand percussion. Acoustic Blender's repertoire is eclectic, including folk, rock, classical, jazz, reggae, country and other genres, and with themes ranging from the personal to the political, the ridiculous to the sublime. Along with numerous originals, the group covers songs by diverse artists such as The Beatles, They Might Be Giants, Dido, Bob Dylan and Talking Heads. They released a CD entitled "Crazy Whirled" in 2008, and contributed two tracks to Two of a Kind's multiple awardwinning 2013 CD "Sing Me Your Story".